Hello friends! I hope you are having a beautiful Friday! I am back today with a little video showing you how I keep my little car organized. In the recent months, I got a new car after the accident and had to redo things. I lost almost all of my stuff including the organizational items when the car was taken to the junk yard. 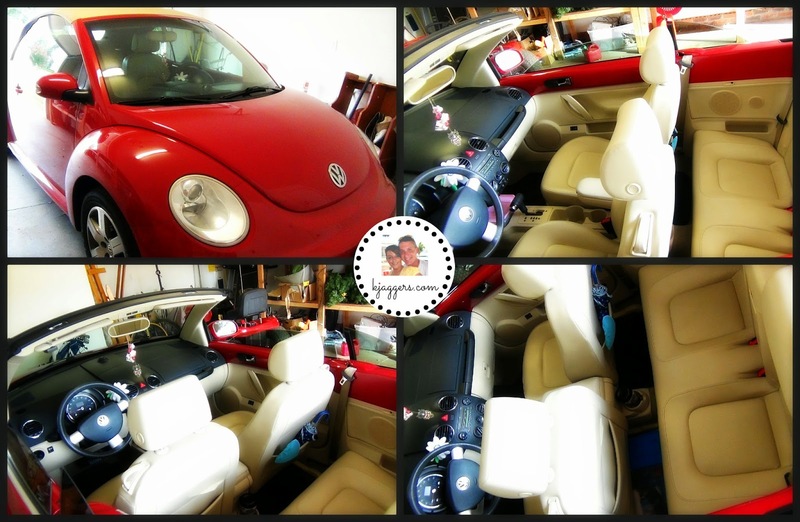 Sooooo...Scott got me a little convertible bug that must be organized if I plan on putting the top down. Otherwise things are going to be blowing out while I am driving down the road. 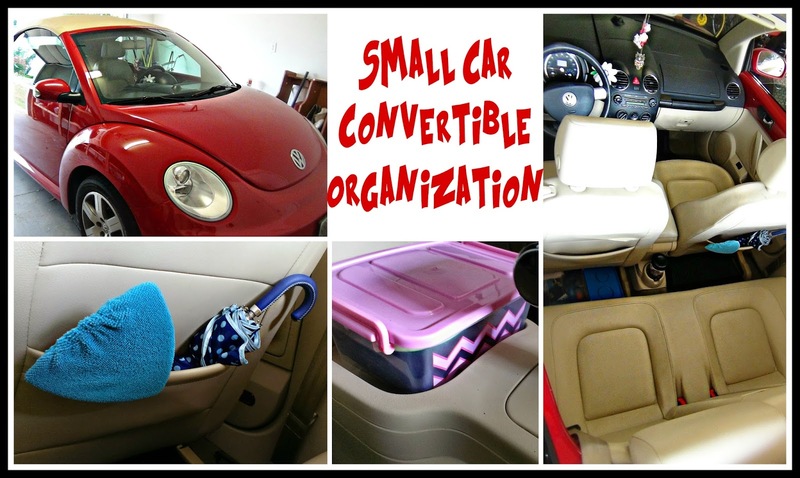 I have a lot of cheap easy organization ideas that will make your car clutter free and will prepare you in almost all circumstances! If you want to check out how I did it, enjoy the video....there are more pictures and info below! So as I said, if I was to put the top down and not have the car organized I am sure I would loose a ton of items. The way I picked to organize my little bug was to use bins that I found at my local Dollar Tree and Walmart to keep everything tucked away and organized. My little bug is the perfect size car. I have never been able to reach my purse in the backseat but now I can! If feels like I fit perfectly in it. I will be the first to admit that my other car drove a little smoother but its been fun having a convertible. But I had to organize it well enough to keep things in if the top is down. The first things in the car are the cute mirror items including a owl necklace and a aloha air freshener. I also have the Volkswagen flower in the vase instead of a real flower that I have to worry about. In the front console I have a little pink container where the lid buckles on which holds random items such as a mini makeup bag, hair brush, hair ties and some lotion. I also have a stain stick that I keep just for accidents. The Glove Box holds my car manual which has pockets in it where I keep random info such as my insurance card, registration, and AAA info. Its all in one spot and I can get it easily if needed. I also keep a water bottle that I wash and return when I use it, some napkins, and also a microfiber cloth just to clean up any messes that might happen. I also store my cute little baseball hat which I wear a lot if the top is down. The Middle Console has my little Tupperware item that holds loose change and money. It fits perfectly and keeps my change from rattling around a lot. I also keep my hand lotion, some pens and paper, my earbuds, some Advil, a wind proof lighter and a can of mace. Normally I also keep my spare set of sunglasses in this area too. Moving to the Back I have a few things because I am normally alone or just with one person so I don't really worry about space. I use the space behind both seats normally and if I do have a extra person in the car, I move everything just to one side. And if I have people total, I just move the items to the trunk. I keep a little container of wipes in the cup holder that does get moved around sometimes but its great to have it out so if something spills we can quickly wipe it up. I don't really keep anything full time in the pocket behind the seat. I just can't really reach it so if we do use it, we clean it out right after we get home. Behind the Passenger Seat, I keep a windshield wiper and a spare umbrella. They don't blow out if the top is down so it works perfectly. Behind the Drivers Seat I normally have a thin Rubbermaid container that holds lots of random items. I have extra leashes and such for our dog, along with little samples of items I can grab in a emergency if needed including a flash light and tire gauge. I also have some extra air fresheners, a quick snack. Also included is a dish towel and a little game for the kids. On the Other side, I keep a little container that holds trash. This is so important to keeping a clean car....especially if you have kids. I never use to have one until my last car and it really made a huge difference. Receipts, gum wrappers, etc get tossed in there keeping the car clutter free. I empty it when needed and we really never put food in there. I just don't wan to deal with any crazy smells. The Trunk is rather small so there is not a lot of storage room. I do have a fully stocked first aid kit that Velcros to the back wall. I love that because its not just bouncing around the trunk. I also have a large bag that is removable when I need more space. It holds a blanket, roll of paper towels, a couple of bottles of water for Cooper. I also have a extra t-shirt that has came in really handy in the past and a thin sweater that also has came in handy when going into cold restaurants and such. I also have a assortment of different reusable shopping bags that I use for quick trips to the store. When I need more space I just take out the entire bag and put it in the garage until I am ready for it again. This system has really worked well for a couple years for me. In my other car ( which was not a convertible ) I still did a lot of the same things but I did not have the same worry of things blowing out as I do now. 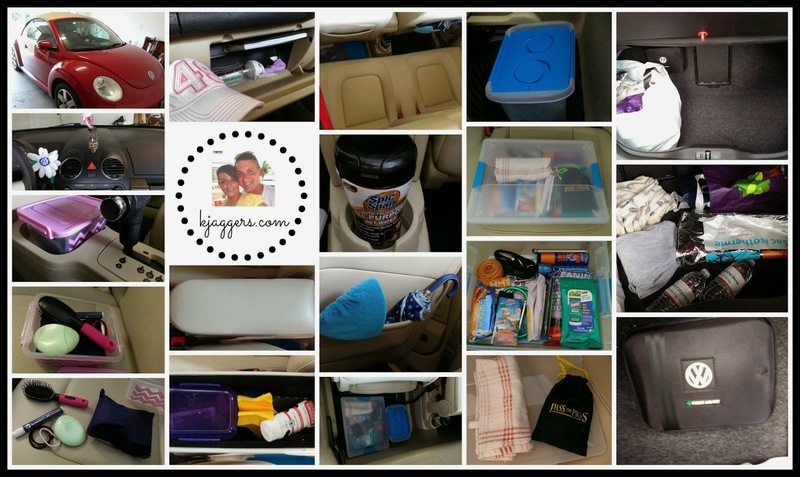 All these storage ideas can work well in any kind of car to help keep it clean and clutter free. If you have small children it might be helpful to have an extra container for their toys and items. I hope you found this video helpful and maybe got a few new ideas on how to make your car storage work better for you! If you have any car storage ideas I would love to hear from you! Have a beautiful and blessed day.